Powered by Android, Sold by Apple. Apple may be waging a thermonuclear war against Android in the courts, but that doesn’t mean that they won’t try to profit off of gadgets running Google’s competing operating system in their online store… even if the word ‘Android’ is nowhere on the item’s product page. 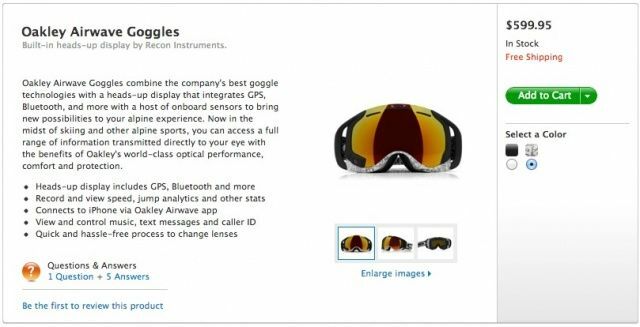 It’s more of an amusing blip than anything else, but Apple is selling the Oakley Airwave Goggles through their online store for $599.95. The Oakley Airwave Goggles are a cool piece of kit which give skiiers and other snow sports enthusiasts not just a solid piece of goggles for protection against the elements, but contain a tiny on-board computer that not only gives them a real-time, data driven heads-up-display (HUD) that shows you your speed, ski time, the altitude, and distance traveled, but also has integrated GPS satellite navigation capabilities, accelerometer-based jump analytics and Bluetooth connectivity to a corresponding iOS or Android app. The only problem is the Airwave’s tiny onboard computer is actually powered by Android. It’s more amusing than anything else. It’s not like the Oakley Airwave Goggles have “Powered by Android” branded on the box, and the Android element is completely invisible to the end user. Still, as far as we know, this is the only Android device Apple is currently selling, and you’ve got to admit, it’s ironic to think of anyone walking out of an Apple Store having purchased an Android-powered device. Does Apple not care, not realize, or are they hiding the Oakley’s shameful pedigree? Certainly there’s no mention of Android on the official product page. It could go either way, but our best guess: Apple doesn’t care if gadgets use Android as long as they aren’t competing with them. Unless Cupertino enters the extreme sports market, the Airwaves are safe.